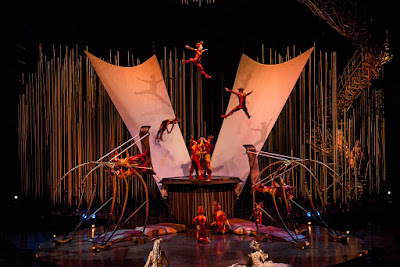 Today, Tuesday July 7th, make your way to Phillips Seafood at the Power Plant on Pratt Street where the restaurant partners with Cirque du Soleil who is promoting the opening of Varekai, Tales of the Forest, at the Royal Farms Arena tomorrow on Wednesday July 8th with a limited run until Sunday, July 12th. Tickets can be purchased HERE. But if you can make it to Phillips Seafood today, and while they last, you can pick up discount cards with a code for your purchase. You can also enter to win a family four pack of tickets as well -the drawing is at 3 p.m. today. Finally, today – guests can meet and greet Skywatcher character (Andrey Kislitsin) and Magioso character (Vladimire Pestov) for a photo opportunity at their Taste of Baltimore event at Phillips Seafood from 11:30 a.m. to 12:30 p.m. So bring your smart phones and selfie sticks – let’s get the party rolling.